For some people, serving as a librarian for teenagers would be akin to inhabiting one of Dante's nine circles of hell. Not Lisa Buckton. She says being the first-ever teen librarian at Burlington's Fletcher Free Library is her dream job. Extroverted and friendly, the 32-year-old native of Saugerties, N.Y., looks the part, with her multiple piercings and pink streaks in her punkish hairdo. Buckton's credentials, however, are serious. While earning her master's degree in information and library science at the State University of New York at Buffalo, she opted to student-teach in Brooklyn's inner-city schools, which, she notes, had "fairly high levels of violence." Later, she took a job as librarian in a high-security juvenile-detention center in East New York, a neighborhood in Brooklyn. Before her arrival, the facility classified books as contraband. "It was really intense," Buckton recalls, "and really phenomenal work." She relocated to central Vermont in July 2011 and worked in a couple of public schools there before taking a job at Colchester Middle School. Though Buckton loved that job, she remembers that, when Fletcher Free Library created the new teen position, she thought, This is the exact work I want to be doing. She started in January at the downtown Burlington facility, its first librarian to focus exclusively on programs and reading materials for 12- to 18-year-olds. Since then, she's heavily weeded the existing collection, replacing damaged and antiquated books with materials that are more diverse, equitable, politically correct and scientifically accurate. But Buckton doesn't intend to call all the shots. 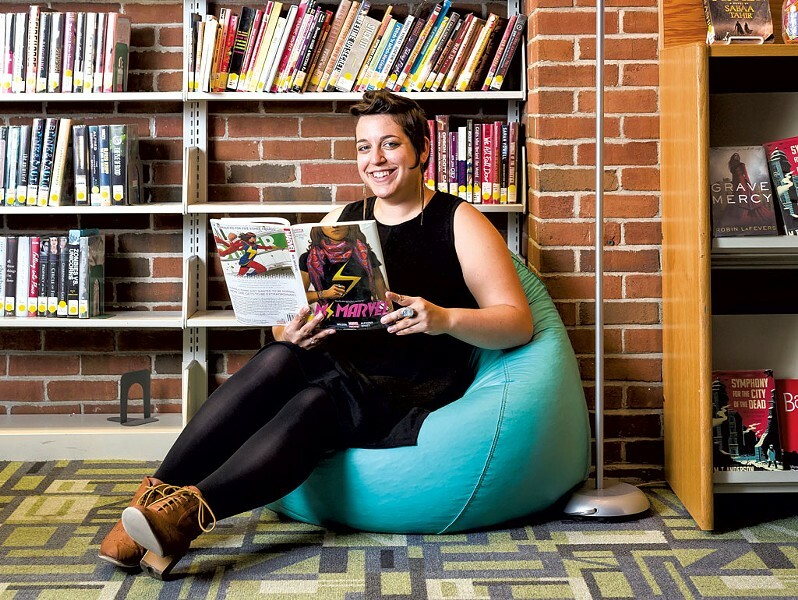 This fall, she plans to create a teen library advisory committee that will give young visitors a greater voice in shaping future chapters of the teen space. SEVEN DAYS: Why did you want to become a teen librarian? LISA BUCKTON: It's something I was always drawn to and comfortable with. I always wanted to work with kids. I'm also a writer, so I was trying to find that balance of doing something I'm really passionate about and also sustaining myself. SD: What excites you about working with this age group? LB: When I was in middle school, I was pretty geektastic and struggled a lot socially. So [as an adult], I never would have thought I'd immerse myself in a middle school setting. But now, it's all about cultivating safe spaces where teens can explore their identity and have adults they can come to who really listen to them. SD: Do you ever see yourself in them? LB: Totally! When I first came into libraries, I wanted to be the educator and adult that was not present when I was growing up. I identify as a queer educator, and that didn't exist for me. I wanted to be somebody who was awesome and also identified as queer that kids could seek out. SD: In the digital age, when fewer teens read books, how do you get them in the door? LB: The role of the modern librarian is not totally print-focused anymore. One of the perks of my job is, I love young-adult literature. I love the ways it explores identity and experience. Sometimes [my job] is just to pair a kid with the right book and to build those relationships with teens and tweens and, after you have those relationships, gracefully sliding something in their direction. But so much of what I do is about allowing them to form new relationships, whether it's with me as a staff member or with their peers. SD: What's the most challenging component of your job? LB: There's been a tremendous amount of outreach in developing this teen program from scratch. It's not the outreach itself that's taxing. It's that, coming from a school setting, I'm used to a structured flow of students entering the library. I could appear in their classrooms and at school events and immediately lure them to the wonders of Library Land. But the most difficult part of my job is missing my students from Colchester and the unique and strong relationships I held with each and every one of them. Also, because this is a new service, there are kids in the library who don't know who I am yet. With some of them, I show up and I'm like, "Hey! My name is Lisa, and I'm the teen librarian and this is what I'm about!" and they're totally into it. Other kids, if you act like that, they freak out because you're really enthusiastic and start talking about glitter and Pokémon and unicorns, and they're like, "Whoa! What's happening? Calm down!" SD: Are there clientele with whom you've really connected? LB: I have some kids who I feel particularly close to. There's one girl, who's maybe 14, who would come in and tell me about the classic literature she's reading; we'd bond over Jane Eyre and talk about what podcasts we're listening to, then give each other listening assignments. Then there was a day in late April, a mere three months since my position started, when I rounded the corner into the teen space and saw 11 or so teens of varying ages utilizing the space simultaneously in diverse ways. Some were studying, others reading quietly, another group clustered together gaming, another doodling and laughing. It was a Field of Dreams-esque "Build it and they will come" kind of moment. I remember thinking, Now, this is a beginning! The original print version of this article was headlined "Shelf Life"